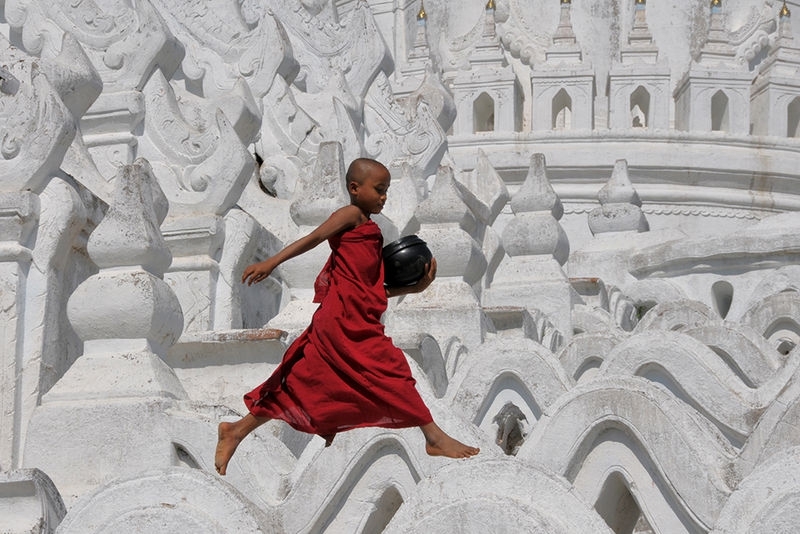 Novice monk having a little fun at the Hsinbyume Pagoda in Mingun, Burma. Taken in December, 2008. Equipment used: D300, Nikkor 18-200mm VR lens at 65mm, f/14, 1/800 sec., ISO 200, handheld, no filters. Love the shot; Like he's floating in the clouds! Excellent timing, I love how neither foot is touching the stone; great color; my favorite. I keep coming back to this shot - it's fabulous! Great work. A wonderfull shot. Excellent timing. Excellent. Timing is often everything, but also great color and subject.